A published service exposes a port on your VM to the public Internet via port forwarding. The exposed port permits both TCP and UDP traffic between services running on the VM and the public Internet. Published services are commonly used to access a VM via SSH or direct RDP, or to access web or application services running on a VM. You define the port you want to open on the VM (for example, port 3389 for direct RDP, port 22 for SSH, or port 80 for web services). You specify a port number or select from commonly-used ports. 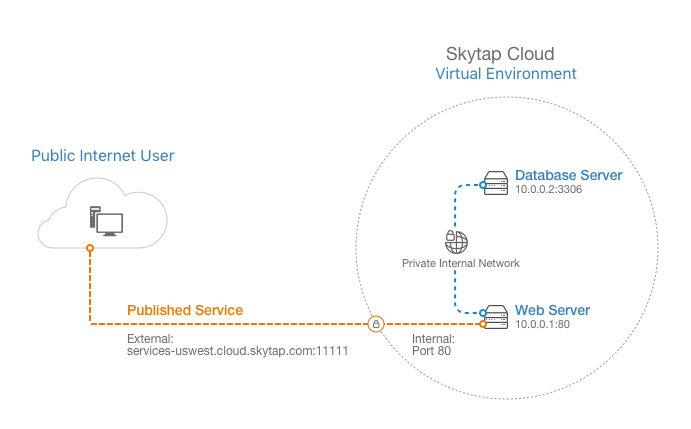 Skytap automatically assigns a public address and random external port number for the published service (for example, services-apac.cloud.skytap.com:12345). When you access the VM via the published service, traffic is forwarded from the published service port (for example, 12345) to the VM port you defined (for example, 3389). The full range of ports used by published services is 8193 – 32767 (inclusive). Skytap does not create or start services on the VM. You must configure the VM guest operating system and applications running on the VM to accept the remote connection. Because a published service exposes a port to the public internet, we strongly recommend that you review Exposing and blocking public Internet access to VMs and Protecting a VM that is exposed to the internet or compromised. FTP and other protocols that make secondary connections on different port numbers. Protocols that do not work behind a Network Address Translation or Port Address Translation (NAT/PAT) gateway. If a VM has an attached public IP address, all of the VM ports are already open to the public Internet. You don’t need to create a separate published service. If a VM has a VPN, all of VM ports are already accessible over the VPN connection. You don’t need to create a separate published service, unless you want to expose the port opening to the public Internet (which is strongly discouraged because of the increased security risks). For information about other VM access methods, see Accessing VMs.